Updating the news that developed early this morning–TSSZ News has obtained a scan of the Nintendo Power review of Sonic and the Black Knight, with thanks to PC the Hedgehog at the Sonic Stadium forums. We’ve provided a link to the scan below, which is hosted at ImageShack. In case you don’t want to look at the scan, here are some choice points and quotes from the review. Sometimes my standard sword attacks didn’t chain together smoothly, leaving me unexpectedly vulnerable, but otherwise combat works well, even in the one-on-one boss duels. Unlike in Sonic Unleashed, Sega got the structure right this time. Most of the required missions are straightforward (such as making it to the goal, sometimes with a time limit, or defeating a boss,) and frustrating tasks and recycled environments are reserved for extra challenges. 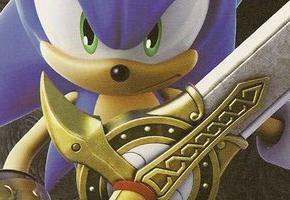 …One thing that’s especially pleasing about Sonic and the Black Knight is its hidden depth. Casual players who just want to race through the levels and see the ending can do so, but if you want more out of the experience there’s a ton to delve into. You can collect equipment, obtain items, forge weapons, interact with villagers, earn new skills in three separate fighting styles, and (eventually) play as alternate characters, but only if you so desire. …’We’ve had hedgehogs with guns, hedgehogs that transform and beat people up, and now this? Is Sega serious?’ Yes, Sega is serious–and they manage to pull it off in fine fashion. Keep checking back for my on-site reports from the New York Comic Con show floor tomorrow afternoon and evening, as Sega shows off Sonic and the Black Knight to the public for the first time.